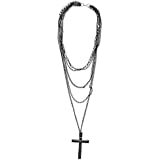 Dispatched from and sold by A Express. Suitable For: 1980's Dress Costume, Hen Party, Race For Life, Fancy Dress, Night Out, Birthdays, Or For Any Other Occasion. 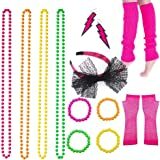 3) 50" Long Beads Necklace, 4) Fishnet Long Gloves (One Size), 5) Gummies (12 Pcs), 6) Striped Legwarmers. 3.0 out of 5 starsGood enough for fancy party. Alright for money but leg warmers a bit on the small side as well as the "gloves" thingy. The end was quite tight around my forearm. So I'm guessing set is more for skinnier people. Still did the trick. Tutu was pretty stretchy and could fit wider range of bodies. 4.0 out of 5 starsGreat set for an 80's fancy dress. The tutu is completely see through, needs cropped leggings or footless tights under! 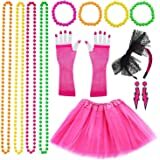 Great set for an 80's fancy dress and good price too. Fortunately in the 80's we wore cropped leggings, as would have to wear with the tutu as it is completely see through (netting)...... which it doesn't look like on the photo! I took others reviewers advice and got the 8-12 size, I'm a size 12 and there is plenty of room as so stretchy in the waist. 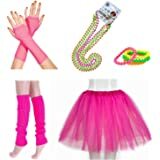 Not only that, but each item was a totally different pink to the others, so pale pink gloves, paleish bangle, bright pink necklace, vibrant pink and black legwarmers and salmon/coral pink skirt. Good job it was meant to look bright and garish. Luckily it was for a dress up day and the fact that a green outfit was pink didn't matter, otherwise we would have had to return it and start again. The order arrived promptly and is value for money and everything described was in package if you are looking for a fancy dress outfit for fun this is great not heavy netting on tutu but for the price I think it is good quality. I can recommend this item and there was plenty of colours to choose from and free delivery made it worth while I would purchase from A Express again.